Hazelnuts, filberts, or cobnuts; this grape-sized, acorn-shaped nut grows in temperate climates like Turkey, Italy, Spain and the Northwest United States. Enclosed in a brown shell, a dark brown, bitter, papery skin covers the ivory-colored meat. To remove the bitter skin of the nut, toast them in a 350 degree F (180 degree C) oven for 15 minutes or until fragrant and the skins begin to flake. Remove from oven and place the hot nuts in a dish towel. Roll up the towel and let the nuts sit (steam) for a few minutes then rub the nuts in the towel briskly to remove the skins. Let cool before using. Toasting the nuts not only removes the bitter skins but also enhances the sweet, rich, buttery flavor of the nut. 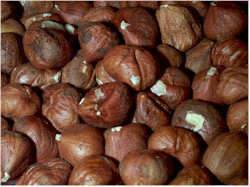 The shelled nuts are sold whole, skinned or unskinned, chopped or finely ground and come in various grades and sizes. Hazelnuts are used in making cakes, cookies, pastries, candies and their flavor complements that of chocolate. Also used to make pastes and oils. Their high oil content causes them to turn rancid quickly so store them in the refrigerator (4 months) or freezer (one year) in airtight containers or plastic bags.